The Nissan Xterra is the smaller, less-expensive member of Nissan's mid-size, off-road-adventure team. Nissan has kept the Xterra true to its original concept as the rugged outdoors type with everything you need, and nothing you don't. For 2008, athe X and S trims get more equipment. 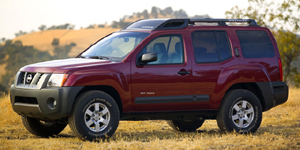 The 2008 Nissan Xterra SUV is powered by a 4.0-liter V6 with 261 hp. Find the used Nissan Xterra of your choice from a dealer in your area. Search our used car listings now.